It wasn't quite the embarrassment Zimbabwe might have dreaded this would turn into, but it was a drubbing for the hosts all right. A career-best 61 in T20Is for Fakhar Zaman, along with contributions from Shoaib Malik and Asif Ali at the death, powered Pakistan to 182 for 4. Zimbabwe could never come close to mustering a response at the steep asking rate the chase demanded of them, and regular wickets fell along the way without an anchor to hold the innings together. In the end, the only positive Zimbabwe could take from the game was how good the debutant Tarisai Musakanda looked in his innings of 43, but it couldn't prevent the hosts from slumping to a 74-run defeat. Zimbabwe captain Hamilton Masakadza put Pakistan in at the toss, perhaps hoping to take advantage of the wicket flattening out later in the day. It wasn't the worst start, with Kyle Jarvis, the pick of the bowlers for the hosts, dismissing Mohammad Hafeez early as the Pakistan opener misjudged the length. Pakistan didn't get the explosive start they might have been hoping against the weakened Zimbabwe side, and at the halfway mark, Pakistan were 78 for 3, with the hosts the happier of the two teams. But Zimbabwe needed all the good fortune they could possibly get against an opposition of Pakistan's calibre, but as is the way these things go, lucky isn't the word you'd associate with Zimbabwe since their ultimately doomed campaign to qualify for the World Cup. With their best fast bowler Jarvis having conceded nine off his first two overs, they would have looked to the 29-year old to provide a strong finish. However, midway through the innings, in the 14th over, he dived forward at long-on to try and attempt a catch to dismiss Fakhar. He misjudged it, broke his thumb, and was out of the contest. Pakistan, meanwhile, had begun to settle in. 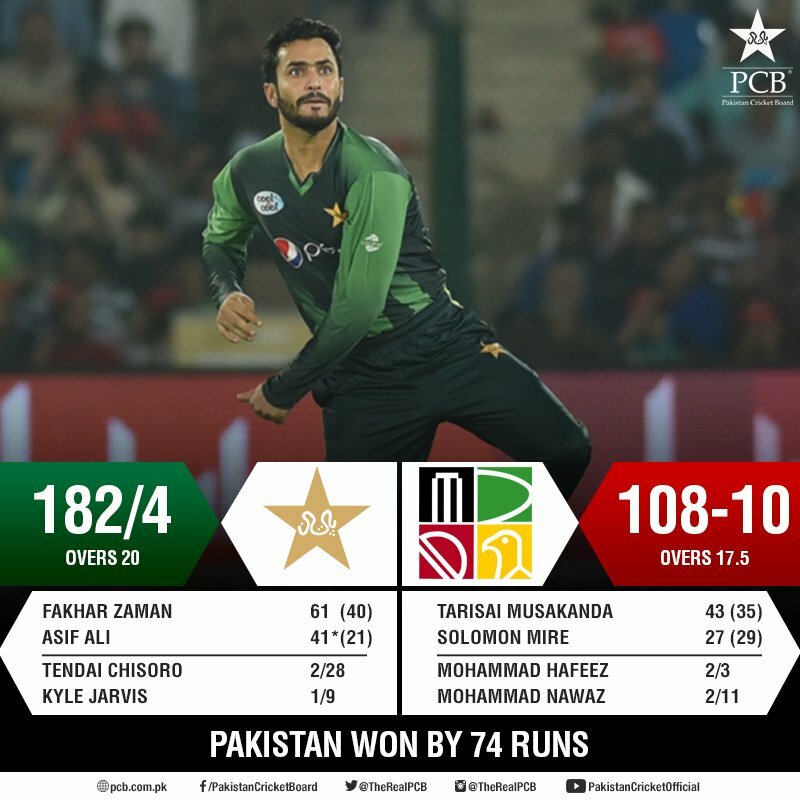 Malik was scoring at a strike rate around 150 without fully getting going, while Fakhar at the other end combined with him for a menacing partnership. It seemed like a pivotal juncture in the game when Tendai Chisoro castled Fakhar with a quicker delivery, but Zimbabwe hadn't reckoned for Asif Ali producing the international performance of his career. Outshining senior partner and man-in-form Malik at the other end, Asif smashed four sixes in a whirlwind 21-ball 41, as Pakistan took 61 off the last five overs. The only surprising element about the chase from Zimbabwe was there seemed to be no attempt at it. The first six overs were going to be the most crucial passage of play in the chase, but Zimbabwe were tentative and meek in their approach to it. No doubt hampered by the loss of Chamu Chibhabha in the first over to Mohammad Nawaz, the only chance Zimbabwe would have had of coming close to the target was an explosive Powerplay. But at six overs, Zimbabwe were 27 for 2 - partly, of course, due to Pakistan's skill with the ball - but their fans might be a touch disappointed with the lack of intent they showed. The last four wickets went for six runs as Zimbabwe folded tamely. Worryingly for them, this 74-run defeat may by no means be the worst they suffer in the coming week. Shukar hai Pakistan ab ek achi team bn rhi hai pehle ki trha. (08-17-2018, 10:03 AM) Selly Wrote: Shukar hai Pakistan ab ek achi team bn rhi hai pehle ki trha.